Pseudomonas is an agent of food spoiling, but its role in the contamination of certain local products is unknown. The objective of this study was to evaluate the diversity and the prevalence of Pseudomonas species contaminating beef, fresh and smoked fish sold in some markets. A total of 182 samples including 95 beef, 41 fresh fish and 46 smoked fish were collected and analyzed. The Cetrimide Fucidin Cefaloridine (CFC) Base Pseudomonas agar and Cétrimide agar were used for Pseudomonas spp. isolation according to the ISO 6887- 2 standard method. Strains were first characterized by API 20NE, then confirmed by polymerase Chain Reaction (PCR), using 16S rRNA and rpoB genes. Serotyping of the strains of P. aeruginosa was done by a slide agglutination test. The prevalence of Pseudomonas was 97.9%, 87.8% and 63.1% respectively in beef, in fresh fish and in smoked fish. A total of 158 (97.5%) isolates were confirmed as Pseudomonas by 16S rRNA. The prevalence of majority species was 46.8% for P. aeruginosa, 26.6% for P. putida and 8.2% for P. fluorescens. The prevalence of the majority of P. aeruginosa serogroups was 20.3%, 14.9%, 12.2% and 12.2% respectively for O11, O5, O16 and O7 serogroups. The study revealed a high prevalence of P. aeruginosa serogroups which represent a risk for human health. It requires improving the health management of the food chain of the products analyzed to prevent their possible alteration or reduce the risk of infections. Pseudomonas, mainly P. aeruginosa is a major agent associated with nosocomial infections and food poisoning [1-3]. There is an emergence of species of the Pseudomonas spp. which express various virulence determinants [4,5]. Among Pseudomonas, P. aeruginosa was known to be dangerous. In fact, P. aeruginosa form biofilms who confer a high power colonization of food spoilage, resistance to antiseptics, disinfectants and antibiotics [6-8]. The prevalence of P. aeruginosa infections was 11.5% in Europe and 17% in developing countries. Food industries accord a particularity to P. aeruginosa because of its ability to grow rapidly and form biofilms . In human being Pseudomonas are also isolated. The most frequently isolated species are P. aeruginosa, P. fluorescens, P. putida and P. stutzeri . Overall mortality related to P. aeruginosa was also evaluated up to 70% and the mortality rate is about 40% [5,10]. Many factors are used by P. aeruginosa to make virulence. We note lipopolysaccharide (LPS) which is an important virulence factor has endotoxic effects. The nature of the LPS molecule including a hydrophobic lipid part, a central core oligosaccharide and another part of polysaccharide defined as O antigen or O polysaccharide [2,4] were the main factors implicated into virulence. The current epidemiological data indicated that most of the 20 serotypes of International Antigenic Scheme (IATS), IATS-O1, serogroups 2 (IATS-O2, IATS-O5 and IATS-O16), IATS-O6, and IATS-O11 are responsible for 70% of P. aeruginosa infections [2,11]. The relationship between virulence of P. aeruginosa and different serogroups has been studied [2,11,12]. Strains having any of toxins secreted by the type III secretion system (TTSS), exotoxin (ExoU) were often as 11 serotypes, whereas 6 serotype strains have been associated with a phenotype of exotoxin U (ExoU) negative . Moreover, it has been reported that some P. aeruginosa serogroups are able to induce high resistance to antibiotics [7,12,13]. Pseudomonas, because of their ubiquitous character, could live in very hard ecological niches . They can be isolated from food such as; milk, dairy products, meat, fish and seafood [3,15-17]. Pseudomonas bacteria are psychrotrophic indicators of spoilage of the meat and can grow thereon at room temperature between 0ºC and 30ºC . Meat and fish are important in the diet of people of West Africa [19-21]. They also provide a valuable supplement in diets low in protein, essential vitamins and minerals . Animal products (meat, fish) contribute significantly to food security, nutrition and poverty reduction [19,23]. In Côte d’Ivoire, fishing and breeding hold a relatively important place in the national socio-economic balance because; they live about 500,000 people and accounts for 3% of Gross domestic product (GDP). However, despite the high nutritional value of fish and meat, they are highly perishable food and face enormous constraints that limit their productivity and competitiveness. Conservation mode, the different ways of smoking fish and selling conditions as well as slaughtering, cutting and distribution of beef carcasses may cause product contamination. If some work was done on the characterization of Pseudomonas linked to nosocomial infections and the environment [15,24] the data are scarce or nonexistent in the prevalence and diversity of Pseudomonas strains contaminating animal products. The aim of this study was to evaluate the prevalence and diversity of the genus Pseudomonas spp. isolated from beef, fresh fish and smoked fish sold in Abidjan, Côte d’Ivoire. Beef, fresh fish and smoked fish were used as biological material. Fish were consisting of horse mackerel (Atlantic horse mackerel); sardine (Sardina pilchardus) and carp (Cyprinus carpio). Pseudomonas aeruginosa ATCC 27853 was used as reference strain for quality control. The cross- type study was conducted in the district of Abidjan, the economic capital of Côte d’Ivoire and located on the Ebrié lagoon, in the south of the country (Figure 1). Abidjan has chosen because, it is one of the original areas of high production and consumption of beef and fish. Also Abidjan has most of 5 billion of people who consume lot of beef and fish. The study was conducted in five districts such as Port-Bouet, Abobo, Yopougon, Adjamé and Bingerville. This stud was led in these districts according to their importance in the production and sale of beef and fish and consent of the manufacturer and merchants to participate in the study. 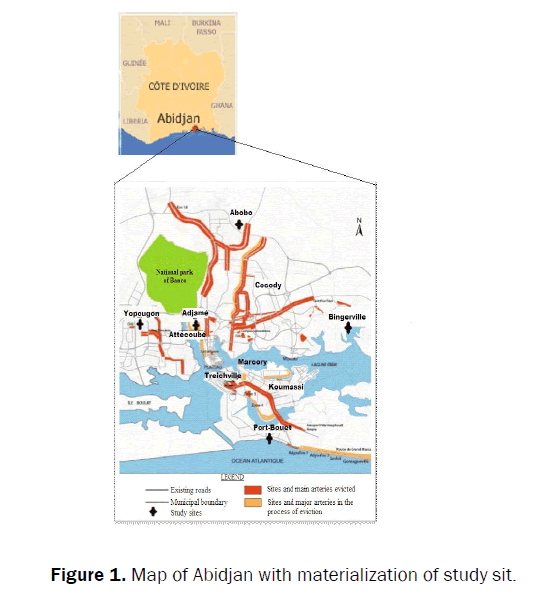 Figure 1: Map of Abidjan with materialization of study sit. The study focused on beef, fresh fish and smoked fish. Fish were made of horse mackerel (Atlantic horse mackerel); sardine (Sardina pilchardus) and carp (Cyprinus carpio). The samples were collected from January to April 2015. The beef was taken in the markets of sale and in slaughterhouses. Fresh fish and smoked were taken primarily on the stalls in the markets. Fresh fish was also taken to Abidjan fishing port. A total of 182 samples including 95 samples of beef, 41 samples of fresh fish and 46 samples of smoked fish were taken. Two hundred grams of each sample were taken and put in Stomacher bags. All samples collected were immediately stored at +4ºC in a cooler containing carboglaces and transported to the laboratory for analyzes. Analyzes were performed within two hours following sampling. A quantity of 10 g from each sample of beef, fresh fish and smoked fish was taken and mixed in 90 ml of sterile peptone water (Oxoid LTD, England) in a polyethylene bag and mixed with stomacher 400 (Colworth, England) for 2 min. 1 ml of each sample was taken and added to 9 ml of trypticase soy broth (TCS) (Bio-rad France). Samples were serially diluted with sterile peptone water 0.1% (Difco) (10-1 to 10-4)  (NF EN ISO 6887, 2004) and surface plated with 0.1 ml in duplicate CFC (Cetrimide, fucidin, cephaloridin) Pseudomonas base agar (Oxoid, Code: 0559, England) supplemented with SR0103 (Oxoid, Hants, England) and cetrimide agar (Biokar, Paris, France). Pseudomonas CFC agar base supplemented with SR0103 was used for isolation of Pseudomonas spp. while, cetrimide agar was used for the isolation of Pseudomonas aeruginosa. On CFC Pseudomonas base agar supplemented with additional SR103, Pseudomonas sp colonies are mucous, greyish, pigmented or not. Then, on cétrimide agar, presumptive Pseudomonas aeruginosa isolated were colonies producing blue-green, brown or fluorescence pigmentation. After 18-24 hours (+/- 1 h) of incubation at 37ºC, the Petri dishes containing 30 to 300 colonies were selected and colonies were counted according to ISO 13720 standard methods [26,27] (ISO 13720, 2010). ISO 7218, (2007) was used to estimate and performed Pseudomonas colonies. Five presumptive colonies of Pseudomonas (as describe in isolation and enumeration of Pseudomonas spp. in food matrices) were took on CFC Pseudomonas base and cetrimide agar. They were streaked on nutrient agar and incubated at 37ºC for 24 h (+/- 1 h) for sub culture. Each of Pseudomonas spp. and Pseudomonas aeruginosa were confirmed with both of King A and King B agar (Biokar Diagnostics, BM10508, France) incubated respectively at 41ºC and 37ºC for 24 h. The production of specific pigments allowed the differentiation of Pseudomonas aeruginosa and Pseudomonas sp. Thus, production of fluorescent yellowgreen pigment (pyoverdine) specific for Pseudomonas spp was highlighted on King B medium and producing a non-fluorescent blue pigment (pyocyanine) specific for Pseudomonas aeruginosa on King A.
API 20 NE strips (BioMérieux SA, Marcy l’Etoile, France) were used for a preliminary biochemical characterisation of the strains and the species were identified using the API database. Template DNA was prepared by boiling 200μl of bacterial suspension in MilliQ (OD600=0.6) in safe-lock Eppendorf tubes for 10 min. The tubes were immediately cooled on ice for 5 min and centrifuged (20.000 g × 10 min, 5ºC). The supernatants were taken and subsequently kept at -20ºC and used as template DNA for PCR studying. Single PCR for characterization of each gene were carried out with 2 μl template DNA, 0.1 μl of each primer (20 mM) (Intégral DNA Technologie, France), 0.2 μl of deoxyribonucleoside triphosphates (10 mM), 5 μl of 5X PCR buffer, 1.5 μl of Mgcl2 (2 mM) and 0.5 U Prime Taq DNA polymerase (Promega Corporation) in a total volume of 25 μl. DNA 16S region amplification was performed using the primer set 16SF–16SR  (16SF 5ÃÂ-AGAGTTTGATCCTGGCTCAG-3’; 16SR 5’-CTACGGCTACCTTGTTACGA-3’) and the following thermal profile was 2 min at 94ºC; 5 cycles consisting of 94ºC for 45 s, 55ºC for 1 min, 72ºC for 2 min; 35 cycles consisting of 92ºC for 45 s, 60ºC for 45 s, 72ºC for 2 min; final extension of 72ºC for 2 min; and final cooling at 4ºC. DNA rpoB region amplification was performed using the primer set rpoB F’ (5’-CAGTTCATGGACCAGAACAACCCG-3’) and rpoB R’ (5’ACGCTGGTTGATGCAGGTGTTC-3’), aligning on positions 1552 and 2298 of the rpoB gene sequence of Pseudomonas aeruginosa UCBPP-PA14 (CP000438). The rpoB DNA was amplified using the following protocol: initial denaturation (94ºC for 3 min), followed by 30 cycles of denaturation (94ºC for 1 min), annealing (58ºC for 1 min) and extension (72ºC for 2 min), with a single final extension of 7 min at 72ºC. Amplification was performed with 10 μl of PCR products which were separated in 1.5% agarose gel for 30 min at 120 V. After amplification, the agarose gel was put in ethidium bromide (0.5 μg/ml) and detected by Molecular Imager Gel Doc™ EZ (Bio-Rad, USA). The O-serotypes were determined by a slide agglutination test using four pools (OMA, OMC, OME, and OMF) and 20 monovalent antisera, O1 to O20 (Sanofi Diagnostics Pasteur), according to the manufacturer’s recommendations. The data was entered with the data processing software SPSS Statistics 20.0 (IBM Corporation, SPSS Inc, Chicago, USA) and transferred to Excel. Statistical analyzes were performed with the software XLSTAT 2014.1 and Ri386 3.0.1 software. The descriptive statistics (frequency, mean, standard deviation) were used for quantitative variables. Geometric means were used to calculate counts. Counts were converted into base-10 logarithm (log10) in order to normalize the distributions. Chi square test was used to test the relationship between variables. The difference between variables was considered significant at p<0.05. To show the clonal relationship between serotype and the food matrix, a Principal Component Analysis (PCA) followed Ascending Hierarchical Classification (AHC) was performed. For AHC, the Ward criterion for hierarchical analysis was used. According to Table 1, the overall prevalence of Pseudomonas in animal products was 86.8%. It is higher at the beef with 97.9%, followed by 87.8% with fresh fish. The lowest prevalence was found in smoked fish with 63.1%. Table 1. Prevalence of Pseudomonas in various animal products. Molecular identification of presumptive strain from the 16S rRNA gene confirmed their belonging to the Pseudomonas (Table 2). 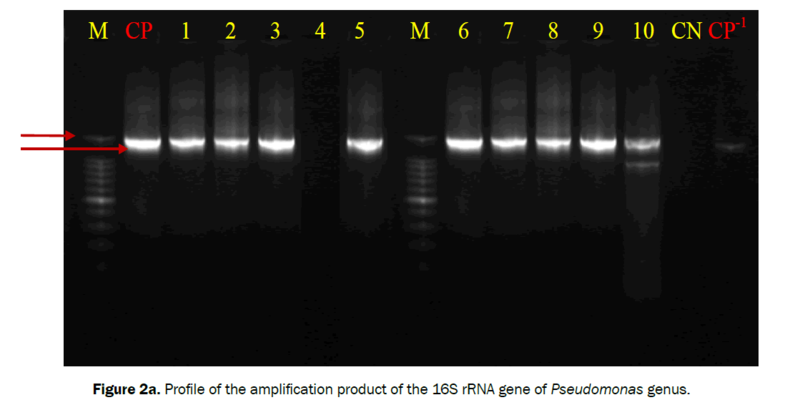 Among 162 presumptive isolates of Pseudomonas, 158 (97.5%) were confirmed positive by PCR amplification of a fragment of 1351 bp of the 16S rRNA gene (Figure 2a). However 74 species of P. aeruginosa identified by API20NE were confirmed by rpoB gene following PCR methods (Figure 2b). Table 2. Frequency of strains confirmed by the 16S rRNA and rpoB genes. Figure 2a: Profile of the amplification product of the 16S rRNA gene of Pseudomonas genus. CP: Positive control, Pseudomonas aeruginosa ATCC 27853; CN: Negative control; M: Marker Gene Ruler 100 bp (Bench Top, 100 bp DNA Ladder, Promega Corporation, USA). 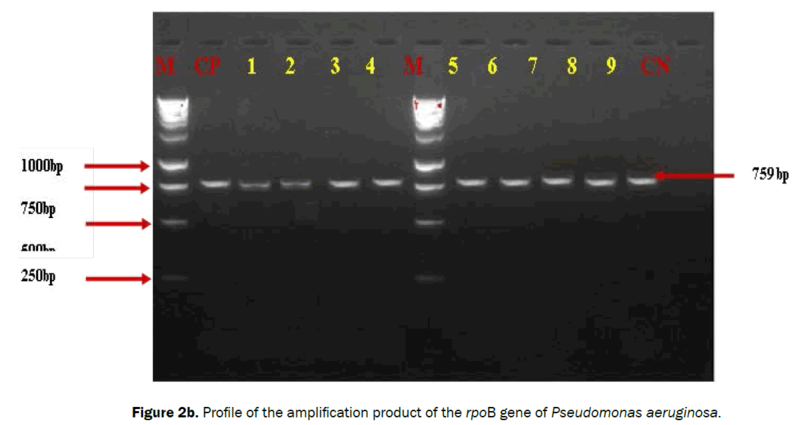 Figure 2b: Profile of the amplification product of the rpoB gene of Pseudomonas aeruginosa. CP: Positive control, Pseudomonas aeruginosa ATCC 27853; CN: Negative control; M: Marker Gene Ruler 250 bp (Bench Top, 1 kb DNA Ladder, Promega Corporation, USA). The Table 3 showed the diversities of Pseudomonas and their species isolated in this study. P. aeruginosa, are more isolated than others with 46.8% following by P. putida 26.6% and P. fluorescens with 8.2%. P. dimunita, P. stutzeri, P. chlororaphis and P. putrefaciens were also isolated at frequencies below 2%. Table 3. Diversity of Pseudomonas isolated from various animal products. 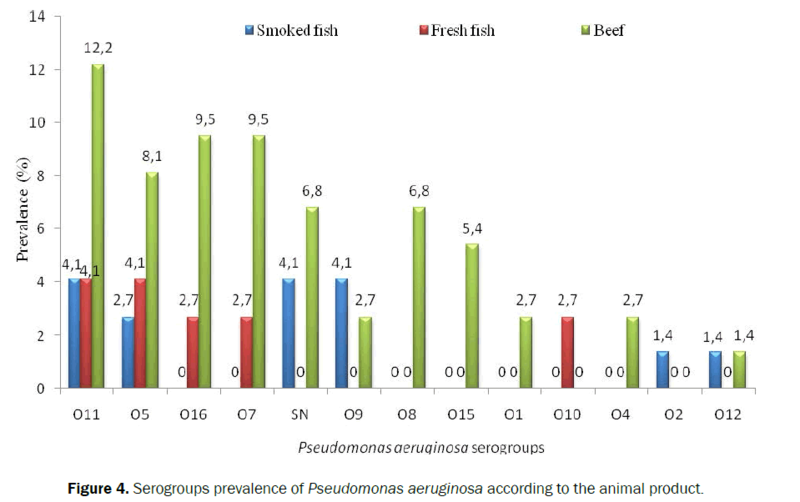 Pseudomonas aeruginosa prevalence (29.7%) found in all animal product is higher in beef than fresh fish (10.1%) and smoked fish (6.9%) (Figure 3). The study has also showed that the prevalence of P. putida in beef was 24.1% and was higher than the prevalence of P. fluorescens (4.4%). The prevalence of P. cepacia in beef, fresh fish and smoked fish is less than 4%. 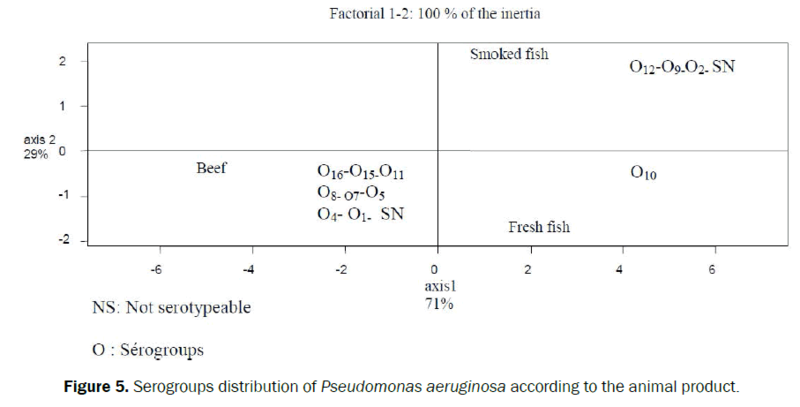 Pseudomonas chlororaphis was only isolated in smoked fish with a prevalence of 0.6%. 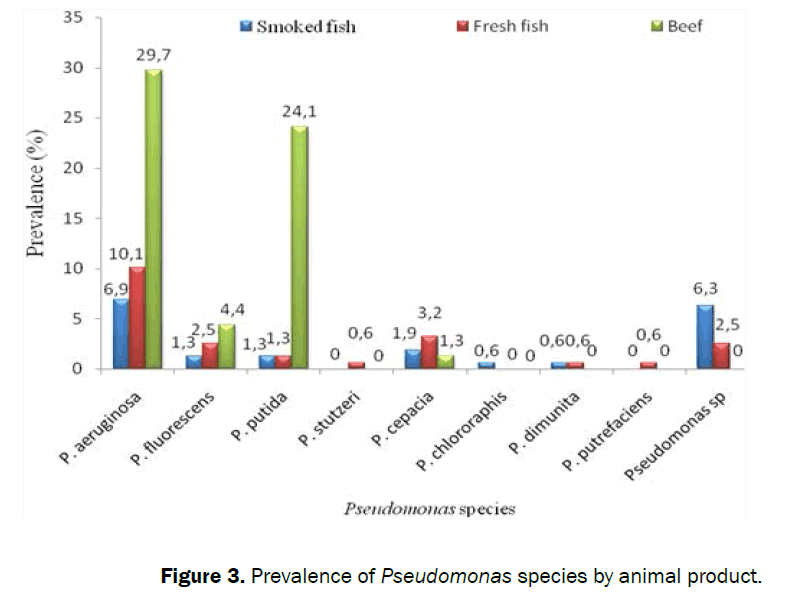 While Pseudomonas stutzeri and P.putrefaciens were identified only fresh fish with the same prevalence (0.6%) (Figure 3). Figure 3: Prevalence of Pseudomonas species by animal product. Serogroups O11 with a prevalence of 20.3% was mostly isolated, followed by the serogroups O5 with 14.9%. However serogroups O16 and O7 have the same prevalence (12.2%). While, serogroups O8, O9, O15, O1, O10, O12, O2 and O4 have prevalence rates below 7% (Table 4). Serogroups O11 and O5 were isolated in beef, in fresh fish and in smoked fish with prevalence ranging from 2.7 to 12.2% (Figure 4). O7 and O16 serogroups were isolated from both beef and fresh fish with prevalence ranging from 2.7 to 9.5%. The serogroups O9 and O12 were isolated from both beef and smoked fish with prevalence ranging from 2.7 to 9.5%. The study showed that serogroups O1, O4, O8 and O15 were isolated only beef with a prevalence ranging from 2.7 to 6.8% (Figure 4). Also, the serogroups O10 and O2 were isolated only fresh fish and smoked fish with prevalence of 2.7 and 1.4%. Table 4. Serogroups diversity of Pseudomonas aeruginosa isolated from animal products. Figure 4: Serogroups prevalence of Pseudomonas aeruginosa according to the animal product. The distribution diagram showed that the majority of serogroups are from beef. These serogroups are O16, O15, O11, O8, O7, O5, O4 and O1; while, serogroups O12, O9 and O2 were specific to smoked fish. For fresh fish, only O10 serogroups was found. However not serotypeable are both related to beef and smoked fish (Figure 5). Figure 5: Serogroups distribution of Pseudomonas aeruginosa according to the animal product. The identification of Pseudomonas following physiological and biochemical characteristics are useful, but it is not enough to distinguish the Pseudomonas [3,16]. Also, conventional microbiological methods for identifying of Pseudomonas from food, environmental and clinical samples are reliable; they require several days to be completed. Rapid detection of isolates contaminating food is very important for consequent treatment decision for agribusiness . PCR has the potential for identifying microbial species rapidly by amplification of sequences unique to a particular organism . The results of this study confirm that a correct identification and characterization of Pseudomonas and Pseudomonas species can only be achieved by combining cultural, biochemical and molecular tests. The molecular results showed that 97.5% of presumptive isolates belonged to the Pseudomonas genus. This high molecular identification rate showed that genomic studies are needed to confirm the exact taxonomic position of Pseudomonas spp [3,16,28]. The results of the microbiological analysis of animal products showed that the overall prevalence of Pseudomonas in animal products was 86.8%. This high prevalence could be justified by the fact that the Pseudomonas germ and mainly P. aeruginosa is very involved in food spoiling. This species can adapt to a variety of environments because of its high genetic plasticity. It can also colonize and infect almost all anatomical sites [2,28,29]. The prevalence of Pseudomonas was higher in beef with 97.9%, followed by fresh fish with 87.8%. The lowest prevalence was found in smoked fish with 63.1%. This difference in level of contamination is explained by the fact that Pseudomonas develops preferentially in at high water activity products. Indeed, the water activity of beef (72% - 97%) and fresh fish (73% - 95%) are higher than the smoked fish (10% - 30%) and therefore it influences the taste of food and susceptibility to degradation [18,30]. Furthermore, the high prevalence of Pseudomonas observed in beef is similar to that reported by Abd ; Franzetti and Scarpellini . Pseudomonas in the surveyed products showed that beef, fresh and smoked fish sold in markets in Abidjan are impaired because they are indicators of psychrotrophic germs or index of alteration of contaminated products [3,14,16]. However, the low prevalence of Pseudomonas observed in smoked fish could be explained by the fact that during smoking, the smoke particles absorbed by fish, inhibit bacterial growth on the product surface . The presence of these germs in the smoked fish samples could be explained by post-contamination due to the bad conditions of sale and storage in the markets [3,31]. A variety of species belonging to the genus Pseudomonas was isolated in this study. The majority of Pseudomonas species isolated in this study were P. aeruginosa (46.8%), P. putida (26.6%), and P. fluorescens (8.2%). The mainly presence of the three species could be justified by the fact that these species can thrive in various environments as able to grow at ambient temperatures (25-300ºC) [9,30]. These results are similar to those reported by Abd  and Franzetti  who were isolated a variety of Pseudomonas species in various food products including beef and fish [1,3,16]. The high prevalence of P. aeruginosa and P. putida could be explained by the fact that these two species are commonly found in humans, animals, plants and their involving in zoonosis [2,9,12]. Pseudomonas stutzeri, P. chlororaphis and P. putrefaciens are lower because they grew in specific conditions of pH, water activity (aw) and temperature . The prevalence of P. aeruginosa and P. putida was higher in beef and lower respectively in fresh fish and in smoked fish. This high prevalence in beef could be explained by the fact that this type of product is capable of harboring pathogens such as P. aeruginosa species and P. putida that are much present in the environment and in the battle of drinking water [32,33]. This prevalence could also be explained by the fact that these two species are able to live in the mucosa, cavities and body of beef and contaminate the finished product after the slaughter. The prevalence of Pseudomonas fluorescence, P. cepacia, P. stutzeri, P. putrefaciens and P. chlororaphis was less than 5% in the three types of products. This could be explained by the fact that these species could contaminate least these product types. The study also highlighted a variety of serogroups of Pseudomonas aeruginosa isolated from animal products. The serogroups O11, O5, O7 and O16 are predominantly serogroups isolated in this study. These results could be due to the fact that these serogroups are mostly involved in animal infections . The same observation was done by Lu et al. who indicated that the serogroups O11 is associated with the production of elastase and some enzymes secreted by the type III secretion system (TTSS) itself involved in pulmonary lesions. They found in their study that the serogroups O11 strains were the most virulent . The O11 and O5 serogroups were isolated more in beef than fresh fish and smoked fish. Serogroups O1, O4, O8 and O15 were isolated only in beef; while, serogroups O2 and O10 were isolated respectively in smoked fish and in fresh fish. This diversity of serogroups could be justified by the fact that strains isolated in this study should be in contact with environmental, aquatic and animal strains. These results agree with those of Lu et al. who isolated in their study, the same number of Pseudomonas aeruginosa serogroups with different prevalences. In contrast to our study, these authors did not isolated O5 and O16 serogroups. However, they isolated the serogroups O3 and O6 with the majority in their study the serogroups O6 (29.3%) and O11 (22.8%). These few differences could be explained by the number of analyzed samples, the nature of the matrices and the sampling of site. Others studies have shown that the serogroups O1 isolated only in beef and O11 isolated both beef; fresh fish and smoked fish are associated with severe nosocomial infections [11,12]. These serogroups could be responsible for the secretion of the exoenzyme ExoS, ExoT and ExoU [2,12]. These enzymes do not initiate infection but promote tissue destruction at the site of inflammation and bacterial dissemination. The ExoS is most often associated with chronic infections due to P. aeruginosa by inducing apoptosis [2,12]. Indeed, when The ExoS enzyme was introduced into the eukaryotic cell, this protein destroyed the actin filaments inducing cytotoxicity and resistance to phagocytosis. The ExoS and ExoT are related to O11 serogroups are often associated with mortality in animals [12,14]. The principal component analysis showed that serogroups O16, O15, O11, O8 O7, O5, O4 and O1 are linked to beef that fresh and smoked fish. The same analysis showed that fresh fish is characterized by serogroups O10 and smoked fish by serogroups O12, O9 and O2. Non serotypeable strains are both related to beef and smoked fish. This belonging serogroups is due to the many virulence factors and the great ability of the microorganism to infect several types of hosts such as plants, insects and animals. The results showed that a correct identification and characterisation of the Pseudomonas species can only be achieved by combining physiological, biochemical and molecular tests. The present study has highlighted the presence and diversity of the genus Pseudomonas in animal products. The species of Pseudomonas mostly isolated were P. aeruginosa, P. putida and P. fluorescens. The study also found a high prevalence in P. aeruginosa belonging to serogroups risk. These serogroups of P. aeruginosa isolated, the most common and known to be potentially pathogenic were serogroups O11, O5, O7 and O16. All these serogroups could be associated with alteration factors, resistance and virulence of individuals; this requires improving the health management of the food chain of the products analyzed to prevent their possible alteration or reduce the risk of infections that could be related to this case. The authors gratefully acknowledge the Department of Bacteriology and Virology of the Pasteur Institute of Côte d'Ivoire, the Department of Science and Technology of Foods, the Laboratory of Microbiology and Molecular Biology of the University of Nangui Abrogoua as well as producers and sellers meat and fish in Côte d'Ivoire for their contribution in making this work. The authors have not declared any conflict of interests. Abd El-Aziz DM. Detection of Pseudomonas spp. in chicken and fish sold in markets of assiut city, Egypt. J Food Qual Hazards Control. 2015;2:86-89. Bricha S, et al. Virulence factors and epidemiology related to Pseudomonas aeruginosa. Tunisian Journal of Infectious Diseases. 2009;2:7-14. Franzetti L and Scarpellini M. Characterization of Pseudomonas spp isolated from foods. Ann Microbiol. 2007;57:39-47. Lisboa T, et al. We should be measuring genomic bacterial load and virulence factors. Crit Care Med. 2010;38:656-662. Mitov I, et al. Prevalence of virulence genes among bulgarian nosocomial and cystic fibrosis isolates of Pseudomonas aeruginosa. Braz J Microbiol. 2010;41:588-595. Keith P. Multidrug efflux pumps and antimicrobial resistance in Pseudomonas aeruginosa and related organisms. J Mol Microbiol Biotechnol. 2001;3:255-264. Meseret M, et al. Antimicrobial drug resistance and disinfectants susceptibility of Pseudomonas aeruginosa isolates from clinical and environmental samples in Jimma University specialized hospital, southwest Ethiopia. American Journal of Biomedical and Life Sciences. 2014;2:40-45. El-Ouali A, et al. Microbiological monitoring of environment surfaces in a hospital in Fez city, Morocco. J Mater Environ Sci. 2016;7:123-130. Iqbal S, et al. Isolation and characterization of Various Pseudomonas species from distinct clinical specimens. IOSR Journal of Dental and Medical Sciences. 2015;14:80-84. Nikbin V, et al. Molecular identification and detection of virulence genes among Pseudomonas aeruginosa isolated from different infectious origins. Iranian Journal of Microbiology 2012;4:118-123. Lu Q, et al. Pharmacokinetics and safety of panobacumab: specific adjunctive immunotherapy in critical patients with nosocomial Pseudomonas aeruginosa O11 pneumonia. J Antimicrob Chemother. 2011;66:1110-1116. Lu Q, et al. Pseudomonas aeruginosa serotypes in nosocomial pneumonia prevalence and clinical outcomes. Critical Care. 2014;18:R17. Le-Berre R, et al. Relative contribution of three main virulence factors in Pseudomonas aeruginosa pneumonia. Crit Care Med. 2011;39:2113-2120. Oku I and Amakoromo ER. Microflora of fresh and smoke-dried fish in Yenagoa metropolis, Nigeria. Afr J Microbiol Res. 2013;7:4451-4456. Golly KJ, et al. Phytochemical study and antimicrobial activity of bark extracts of Ceiba pentandra (L.) Gaertn. (Bombacaceae) from Côte d’Ivoire on antibiotic resistant Staphylococcus aureus and Pseudomonas aeruginosa. Br Microbiol Res. 2015;9:1-7. Virupakshaiah DBM and Hemalata VB. Molecular identification of Pseudomonas aeruginosa from food borne isolates. Int J Curr Microbiol App Sci. 2016;5:1026-1032. Voloski FLS, et al. InÃ¯Â¬Âuence of cutting and deboning operations on the microbiological quality and shelf life of buffalo meat. Meat Science. 2016;116:207-212. Neumeyer K, et al. Development of a predictive model to describe the effects of temperature and water activity on the growth of spoilage Pseudomonads. Int J Food Microbiol. 1997;38:45-54. FAO et al. Livestock sector development for poverty reduction: an economic and policy perspective – Livestock’s many virtues. Roland-Holst, Rome; 2012. FAO et al. The State of World Fisheries and Aquaculture; contributing to food security and nutrition for all. Contributing to food security and nutrition for all, Rome; 2016. Oyase A and Jemerigbe R. Contribution of aquaculture to poverty reduction and food security in Nigeria. Int J Appl Microbiol Biotechnol Res. 2016;4:26-31. Wannous DC. The potential contribution of livestock to food and nutrition security: the application of the One Health approach in livestock policy and practice. Rev Sci Tech Off Int Epiz. 2014;33:475-485. FAO. United Nations Food and Agriculture Organization. FAO yearbook, Fishery statistics capture production. 2000;86:99-100. Moroh J. et al. Diversity and antibiotic resistance of uropathogenic bacteria from Abidjan. Afr J Urol. 2014;20:18-24. Khattab M, et al. Genetic identification of Pseudomonas aeruginosa virulence genes among different Isolates. J Microb Biochem Technol. 2015;7:274-277. Ramprasad BP, et al. Role of Pseudomonas in nosocomial infections and biological characterization of local strains. Journal of Biosci Tech. 2010;1:170-179. Idah PA and Nwankwo I. Effects of smoke-drying temperatures and time on physical and nutritional quality parameters of Tilapia (Oreochromis niloticus). International Journal of Fisheries and Aquaculture. 2013;5:29-34. Lokuruka MN. Food quality perspectives in African fish products: practices, challenges and prospects. International Journal of Fisheries and Aquaculture Sciences. 2016;6:15-32. Aman, et al. Prevalence of antimicrobial resistant Pseudomonas aeruginosa in fresh water spring contaminated with domestic sewage. Journal of Biological and Food Science Research. 2012;1:19-22. Klrissa S and Mohammad K. Pseudomonas aeruginosa: A review of their pathogenesis and prevalence in clinical settings and the environment. Infection, Epidemiology and Medicine. 2016;2:25-32.